Dr. Block and her team are on a mission to create a "wired ocean" where live feeds of predator movements are relayed by a series of "ocean WiFi hotspots" on moored buoys and self-propelled Wave Gliders (as shown below), carrying acoustic receivers. The technology, developed by Liquid Robotics, a company from Sunnyvale, California, is central to Dr. Block's "Blue Serengeti Initiative," which builds on the Tagging of Pacific Predators (TOPP) project, part of the international Census of Marine Life (2000-2010). Fixed buoys fitted with data receivers can only give you a small amount of information about fast moving ocean creatures. 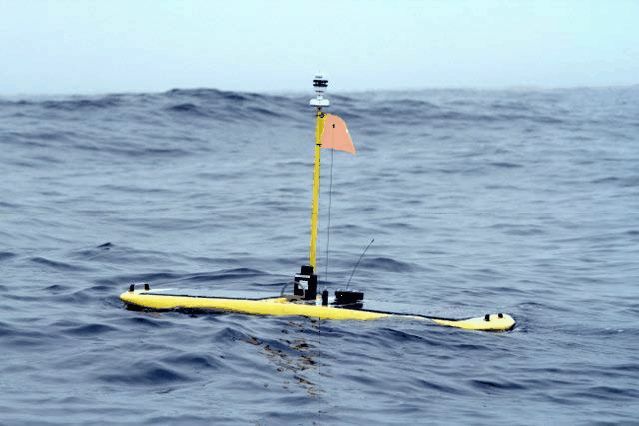 Just off San Francisco, between Monterey Bay and Tomales Point, a sleek unmanned robot has joined in the surveillance of great white sharks and many others. Professor Barbara Block of Stanford University is using acoustic tags to add to 12 years of surveillance of thousands of animals (4,300 to be exact). The "wired ocean" now displays live feeds of predator movements (TOPP is the Tagging Of Pacific Predators project, a collaboration among five nations) - like a war map. Fisheries management models and climate change responses can now be improved and with he whole west coast coming "online" eventually, tracing everything from salmon stocks to great white, mako and salmon sharks. It's also possible to track blue whales, various marine turtles and many more! Dan Basta, Director of the Office of National Marine Sanctuaries, part of the National Oceanic and Atmospheric Administration's National Ocean Service explains why he believes TOPP is so important. "Animals may tell us more about how the world works and is changing than any other source of knowledge." You will certainly want to join in, so you can join "Shark Net," which is an app from the Apple store and Prof. Block will get you linked up with real wild animals in the ocean's wildernesses. Get those iPhones and iPads out! As well as the general public however, many scientists are also using this information to wire up hot spots such as congregations of great white sharks, as shown last Thursday on "Great White Highway" at 9.00pm on the US Discovery Channel. Dr Block is doing great work as she explains, "my mission is to protect ocean biodiversity and the open sea."